Ross started working with glass at the Cleveland Institute of Art in 1991. He graduated with a Bachelor of Fine Art with a major in Glass and a minor in Metals. He has studied and taught at many prestigeous glass schools across the country including the Penland School of Craft and the Pilchuck Glass School. In 1997 Ross began working as an apprentice to William Morris becoming a member of his team in 1999, working alongside Bill until his retirement in 2007. 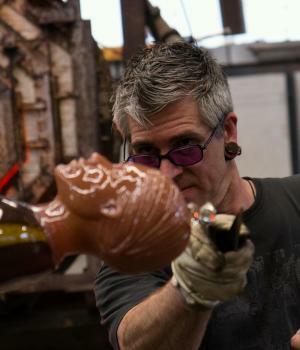 Ross has had residencies at the Tacoma Museum of Glass and Corning Glass Museum in the last few years, and is in the proces of building his own hot glass studio. Ross' pieces are typically narrative, working mainly with figurative elements and symbolic objects. His work currently shows at a number of galleries across the country and he teaches in the US and Canada.